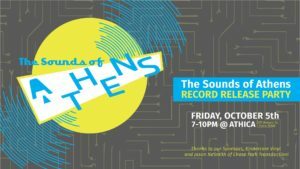 We are so excited to invite you to The Sounds of Athens Record Release Party on Friday, October 5th from 7-10 pm! This has been a collaborative project between us at ATHICA, musicians of the Athens community, Kindercore Vinyl, and Chase Park Transduction. We can’t wait to share the music and fun of this record release with you! We will have records for sale to the public for $5 each at the event. This project has been a labor of love, which wouldn’t have been possible without the awesome support and help of Micki and Cash and everyone at Kindercore Vinyl who have worked to manufacture this record. We also want to thank Jason NeSmith of Chase Park Transduction who has been our vinyl mastering wizard for this project. The Sounds of Athens is an idea which came from The Golden Record Exhibition opening in our new space. The Golden Record is an exhibition inspired by the images and sounds of “The Sounds of Earth,” the recording that is now traveling on the Voyager spacecraft far beyond our galaxy, bearing hundreds of sounds. To accompany the visual representations we have in our current exhibition, we decided an album highlighting the diverse musical community of Athens would be a great project. We had an open call for musical submissions and received a lot of wonderful music. The musicians and bands represented on the record give a good look into the eclectic music scene we have in our town. The record release party is part of our closing events for The Golden Record Exhibition. We will have live music from Jason Fusco of SHEHEHE.